When you are self-employed, your health insurance premium is tax deductible above the line. If you are getting a premium subsidy tax credit when you buy insurance from the exchange under Obamacare, you can’t double-dip. You can only deduct the net, unsubsidized premium. The subsidy of course depends on your MAGI, which depends on your above-the-line deductions. We have this nice circle going. So how do you figure out how much you are allowed to deduct? I don’t know whether the law or the regulations already spelled this out. 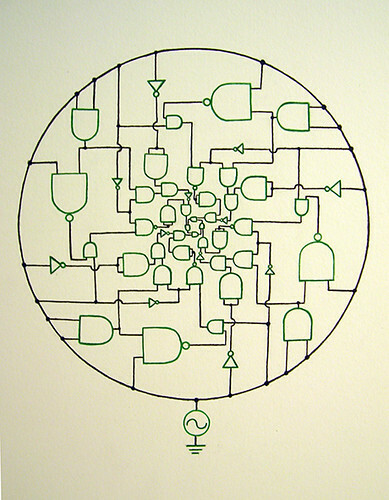 Mathematically you can solve it by iteration. You start out with the full health insurance premium as the tentative deduction (D0). 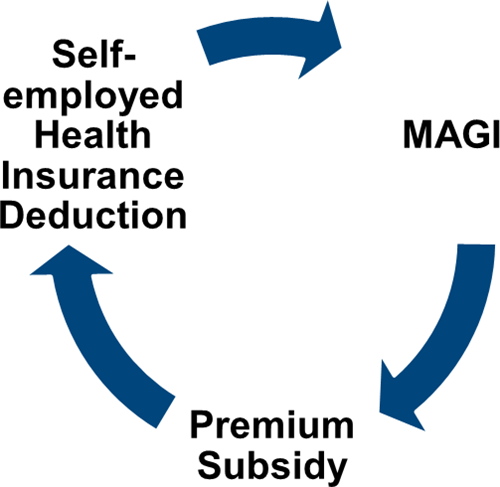 It lowers your MAGI, which gives you a subsidy, which lowers your unsubsidized premium allowed as a deduction (D1). 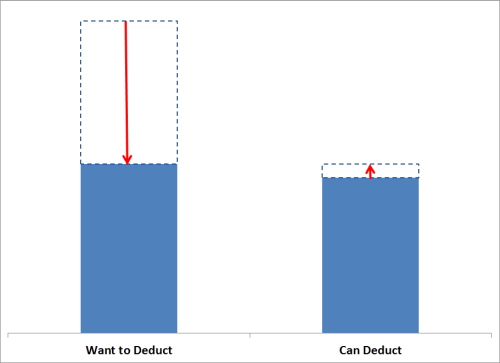 Then you start reducing the tentative deduction D0, which increases your MAGI, which lowers your subsidy, which raises your allowed deduction D1. This narrows the gap between D0 and D1. You do this over and over again until the two numbers D0 and D1 converge to the same value. This simple example can be solved algebraically. When that X% number depends on a lookup table, it gets more complicated. It would still be very easy for a computer to get the answer by trial and error. I’m sure tax software will be able to do the iterations under one second. I don’t know how the IRS will come up with instructions for people to do it with pencil and paper though. [Updates:] The IRS issued guidance on how to calculate the subsidy tax credit and the deduction. Read more in IRS Guidance On Circular Reference in Obamacare Premium Subsidy and Deduction. Some tax software programs incorporated the iterative calculations. See Tax Software Bake-Off: Self-Employed Health Insurance and ACA Premium Tax Credit. Isn’t the subsidy based on your MAGI for the prior year? If so, I would think there will be no conflict at all here… your MAGI for the purpose of deducting is based on the premiums you paid in the tax year for the return, but your MAGI for the purpose of determining the next year’s premiums is that number adding back in the deducted premiums. Two different MAGIs for the two different purposes, but that’s pretty normal for these sorts of things. It’s not. You can get the subsidy as an advance (similar in concept as tax withholding, only in reverse) in 2014 based on your estimated 2014 MAGI. Then you square up on your 2014 tax return, again similar to how you square up your tax withholding with the actual amount of tax you have to pay. There’s no “adding back” or two MAGIs. The same MAGI is reduced by the deduction and it drives the ultimate subsidy, which affects the deduction, all on the same tax return. P.S. Here’s a video produced by healthcare.gov about the subsidy and the subsidy advance. If it’s based on the MAGI in the prior year, then income changes during the year wouldn’t affect the subsidy. The video shows that’s not the case. Not quite. Your last line is the subsidy, not the unsubsidized premium. Ah. Good call. 5205.48 then? Any better way of solving this then using data tables? Solve for d. When that $60k number is lower, say $45k, which takes it below 300% FPL and makes that 9.5% number also depend on d, it becomes more complicated. Thanks. The question made me think it couldn’t be solved algebraically so I did not even try. On the other hand, is that equation only working because of a decent size buffer before you drop out of 9.5%? The simple example is just a special case when the max percent is fixed at 9.5% due to a large buffer as you say. It’s still version A but the max percent is calculated by the MAGI. How you plug in the max percent algebraically in order to solve for d is the question. Once you figure out the max percent should be 5.53%, formula A gets $1,572. A nice quadratic equation to solve by hand. I made a spreadsheet that includes a table of fpl/max percent in 1% fpl increments from 133 to 400 (I assume you don’t go more narrowly then that, but am unsure) and included 2013 FPL lookup, where you have to manually adjust the Max Percent used in the formula until it hits a calculated target which keeps moving. I can’t think of how this would be done by the IRS without computers – they can do it iteratively having people look up tables and then compute line by line, but there is a limit to how many times they would expect someone to do this and without many you are off by meaningful amounts. We are looking at a small difference due to rounding. I got $1572 for $30k without any rounding. You are right both the FPL % and the max percent will probably have to be rounded to a nearest increment. Maybe the IRS will set up a web calculator. It’s trivial with a computer but very difficult with just paper forms and tables. They can get out of this tricky math problem if they exclude the deduction from the MAGI but what go into MAGI are set in the law. Only Congress can change that; the IRS can’t. Is the IRS required to resolve this situation by providing forms, tables, and instructions? Or can they simply publish the rules and formulas and require tax filers to figure it out on their own? Maybe they are not *required* to do so but they provide instructions and worksheets now. I expect them to do the same for this. $2,191.63 for $30K? May be I should a computing device. Am I correct in assuming you can take the full, finally derived deduction regardless of whether you had any subsidy applied in advance to reduce your monthly payments? In other words, you aren’t necessarily deducting what you actually paid each month, but rather the full premium? Not quite. You deduct the amount after you solve the circular reference. It’s not the full, unsubsidized premium; nor is it the amount you actually paid. OK, I’m not a math genius. But maybe I can get somewhat of a straight answer. We are self-employed, but fall beneath the poverty line enough to get full subsidy. Should I pay the monthly premium each month so I can use it against my AGI on my 2014 taxes to get in a lower tax bracket, and then realize the subsidy when I file, or just take the full subsidy now because it will all wash later anyway? It doesn’t matter. If you are indeed eligible for a full subsidy that covers 100% of the premium, you are not going to be able to use it against your AGI on your 2014 taxes to get in a lower tax bracket. No double dip. Harry, thanks for your reply. I know you say no double dip, but at this point line 29 is for writing off self-employment health insurance. Do you know of any IRS guidance on how subsidies will be factored in? The IRS obviously hasn’t released 2014 tax forms and instructions yet. I suspect that deduction will be reduced not only by the subsidy you apply in advance but also by the subsidy you calculate on the tax return. If you want to take a chance to game it, pay in full and see what happens. This situation occurred to me recently, and I have a much simpler solution. Pay the unsubsidized premium up front to get your MAGI as low as possible, so you qualify for the maximum subsidy, and claim that subsidy on your tax return after year-end. Under the principle that if you deduct something that’s later refunded/reimbursed (a principle we see at work all the time with state taxes paid/state refunds), then you simply claim the subsidy as income on the following year’s taxes. Simple example: In 2014, I’m married no kids and make $65k/yr. If I don’t take the advance subsidy, we’ll say my insurance costs are $5k/year, making my MAGI $60k/yr. So I claim a credit for (let’s say) $3k. Since that’s a refund of premiums I deducted, I report the $3k as income in 2015. If I do take the subsidy, we’ll say I pay only $2k/year for insurance. (I think the cut-off for the subsidy for 2 people is ~$62k/yr…we’ll assume that’s the case for this example.) By paying only $2k/yr, my MAGI is $63k/yr and I no longer qualify for the subsidy…so now I have to PAY BACK the $3k/yr advance subsidy that I didn’t qualify for. In the first scenario, I paid $5000, got $3000 refunded, but have to pay tax on that $3000. At that income level for MFJ, I’m probably paying 15% on that $3k, so overall I’m out about $2500. In the second scenario, I pay $2000 during the year and another $3000 at year-end, so I’m out $5000. Moral of the story: If you’re self-employed and potentially eligible for a subsidy, DO NOT take the subsidy during the year. This is all based on a plain reading of IRC 162(i) (“allowed as a deduction (…) the amount paid during the taxable year for insurance (…)”) and the definition of MAGI for purposes of calculating the premium subsidy (AGI plus excluded foreign income plus tax-exempt interest/dividends). As much as I love math, there’s no reason to introduce complicated math to the problem when a little reading and logic is all it takes. A deduction that you took and you got a refund is added back as income next year. A credit that you took more than you qualify for will have to be added back as extra tax, not as income, next year. There’s also a school of thought saying you can only choose one — either deduct or get subsidy — but not both. We will have to see how this plays out when tax forms and instructions come out. Ah, but that’s the thing. In that example, I did NOT claim a credit I didn’t qualify for. I absolutely qualified for the credit based on my MAGI. Of course, my MAGI was calculated by using a deduction that I was reimbursed for in the following year, but that’s a reimbursed deduction, which is an entirely different animal from a reimbursed credit. I’m really curious about the line of thinking that says you must choose the subsidies OR the deduction. I’m guessing that’s based on 162(l)(2)(B), which disallows the deduction when the self-employed individual is eligible to participate in a subsidized plan through their employer or their spouse’s employer. I doubt that applies here because the government isn’t the taxpayer’s “employer”. But if it does, then it’s still not a choice a taxpayer can make. If they’re “eligible” for subsidies on the exchange, then under this interpretation of 162(l)(2)(B), the person may NOT deduct self-employed health insurance. There’s no choice about it, whether they take the subsidies or not. Thanks for an excellent topic for my blog! For those who are watching new comments, there’s a follow-up to this: IRS Guidance On Circular Reference in Obamacare Premium Subsidy and Deduction. Thanks for an excellent post and follow up, one of the few places I’ve found that deals with the actual issue, and even predicted the IRS response before they provided it. I have shared a link to this post on the Covered California facebook page and may continue to do so when people post self-employed tax-related questions.